Comprar K&F Concept mochila bolso de cámara para fotografía viaje 9.06*5.51*14.57inch en línea, envío gratis y 30 días de garantía de devolución. 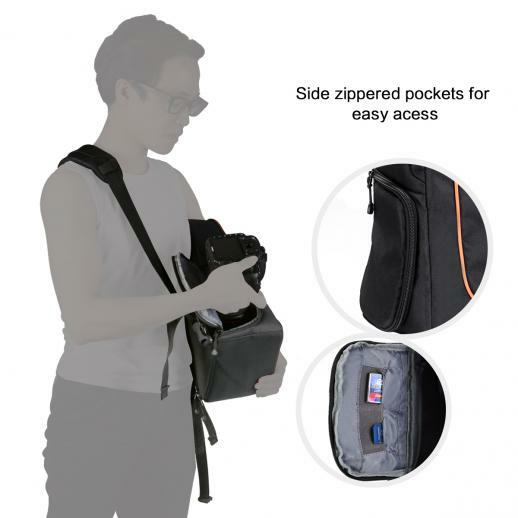 • La mochila honda se adapta a la cámara réflex digital con lente zoom estándar acoplada, 1-2 lentes extra o un flash y accesorios, un trípode compacto o monopod y artículos personales. • El diseño de la mochila permite una rotación rápida desde la parte posterior a la parte delantera de su cuerpo, lo que le brinda un acceso fácil y rápido a su equipo (bolsillos laterales con cremallera para un acceso más fácil, antirrobo de diseño abierto hacia atrás). • Modelos de cámara DSLR que se ajustan a la bolsa: Canon EOS Rebel SL1 / T3 / T3i / T5, Nikon D3200, Nikon D3300, Sony Alpha A5000 y Sony Alpha A6000, etc. • Se incluyen dos correas removibles con hebillas de liberación rápida para la conexión rápida de sus trípodes. • ¡Esta bolsa de viaje liviana y duradera es ideal para usar en cualquier lugar! Mejore el placer de su viaje y déle una sensación de seguridad. estilo honda occidental sujeta y transporta 1 cámara sin espejo o 1 cámara DSLR con lente acoplada, flash, mini placas, trípode pequeño, auriculares, teléfonos inteligentes, billeteras, gafas de sol, baterías, tarjetas de memoria, cables de datos y otros accesorios pequeños, etc. Lleve su equipo de cámara cómodamente en la parte posterior, cuando esté listo para disparar, simplemente tire de la eslinga hacia adelante para acceder rápidamente a su cámara. 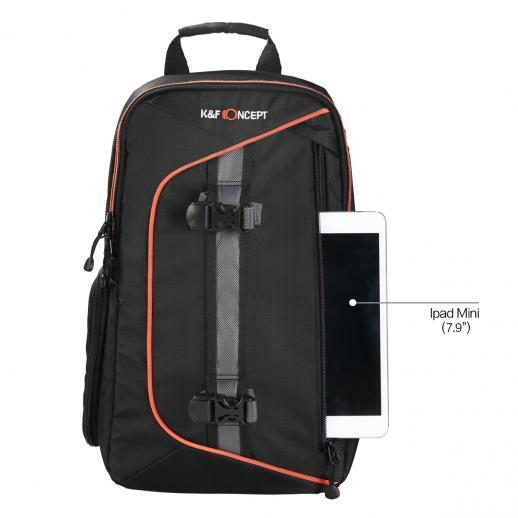 • Fits in the overhead compartment of most commercial aircraft worldwide. 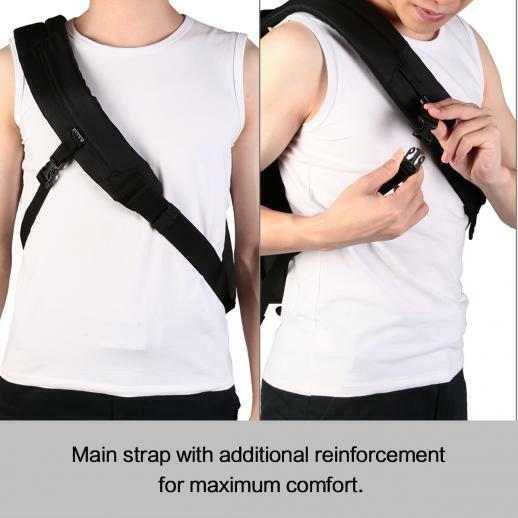 •Main strap with additional reinforcement for maximum comfort. 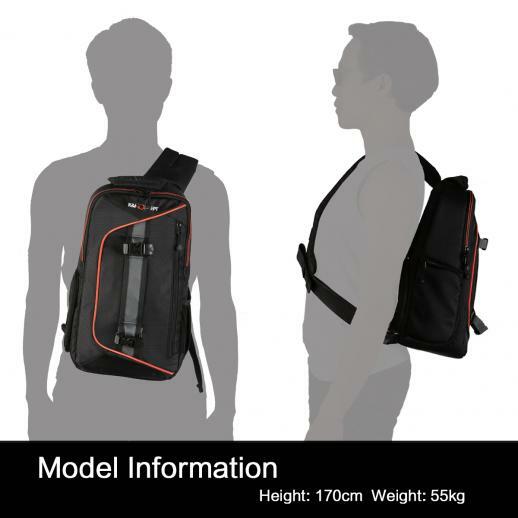 • Rain cover included, wearing the bag on one shoulder or accossing chest as a sling. •Separate compartment for ipad Mini ,with a vertical zippered pocket at front, also available for other accessories. • 3D padded back for improved breathability and comfort in hot weather. • Removable dividers inside to perfect setup. • Mesh side pocket provides quick storage for a water bottle or other items you want to keep close at hand. • KF exclusive design / quality assurance / small body big capacity.assurance / small body big capacity. 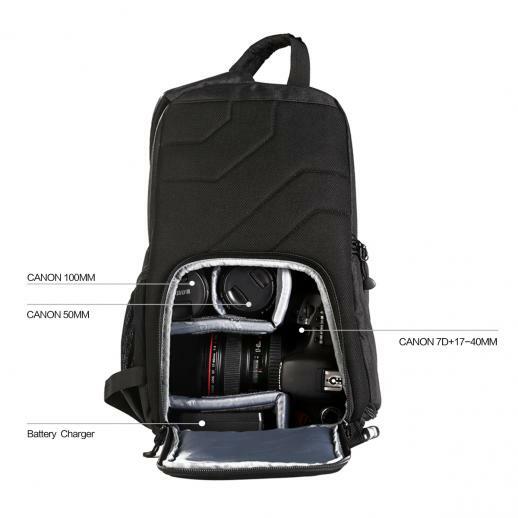 • Tons of storage pockets plus customizable interior dividers give you lots of choices for storing your cameras, lenses, cleaning kits, cards, straps and more . • Side zippered pockets for easy acess,（Antitheft）back-open design. 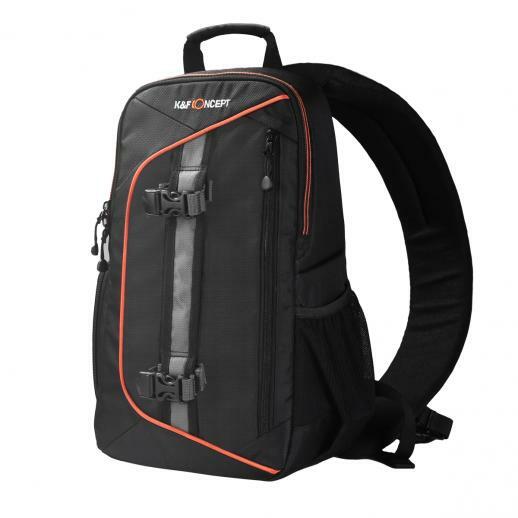 • Ergonomic design includes padded back support and a customizable strap for comfortable extended use. • Airflow back system multi-panel design keeps your back and shoulders comfortable with soft padding and deep airflow channels that work to improve circulation. 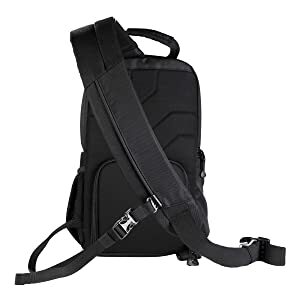 • Additional straps to hold light and small tripod, adjustable extra-wide padded shoulder strap. Great quality construction. Smaller the expected but that is me not reading the exact size and how much equipment I actually have.Would recommend if you only have one camera and a couple of lenses. More equipment then that and you will need a larger bag. 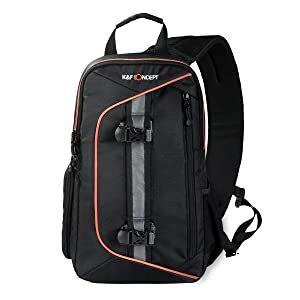 Would recommend it if your planing on carrying just a bit of equipment and traveling light. Handy little camera bag with plenty of different pockets! 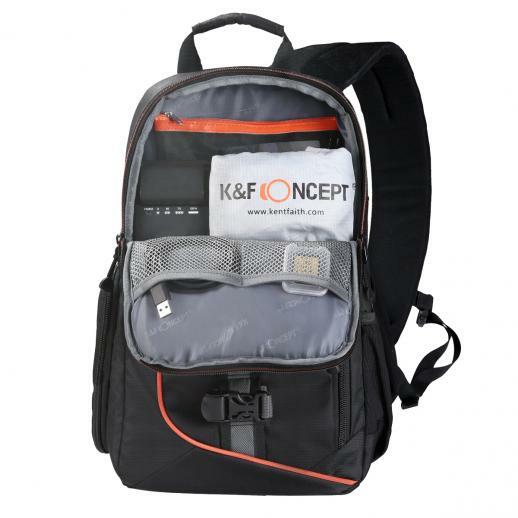 The top pouch holds a camera survival kit from K&F - cloth, spray lens cleaner, dust blower, and rain cover for the bag. Plus the side pouch can either hold a bottle or bear spray, for those days shooting in the woods ;)Not sure how they're fitting DSLR's and a second lens in there, cause I'm having trouble setting up the dividers to hold a little A6500 and more than a tiny prime and standard zoom.The tripod straps hold pretty snugly, but the bag size is not practical for a regular sized tripod. Instead, I got a COMAN MT60 [24"] tripod, and it fits perfectly! Perfect little travel companion :)Just be reasonable about what lenses you bring, cause you definitely can't get your DSLR and zoom lens in there. Just the right size for my DSLR zoom. This seems to be well designed and well constructed, but I only just received it. I am able to fit my Canon 80D with 70-300L lens into the main compartment for quick access, with lots of room for other lenses and equipment. The bag is well padded, easily adjustable, and comfortable. It comes with a handy lens cleaning kit. 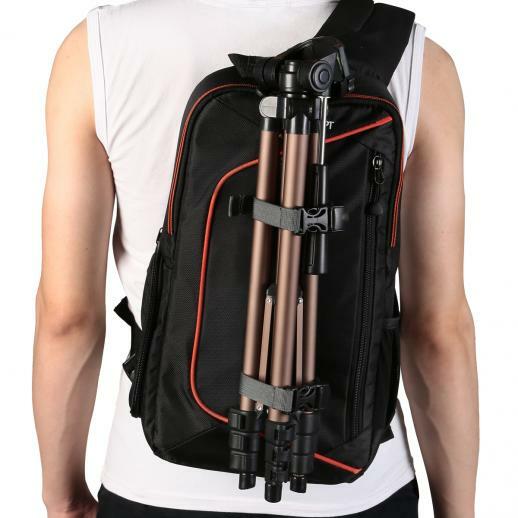 The straps for the tripod are removable so they will not catch on things when the tripod is not being carried. Perfect size!! Easy to carry and go. Versatile.